Metropolitan Philaret, in the world George Nikolayevich Voznesensky, was born in the city of Kursk on March 22 / April 4, 1903, into the family of Protopriest Nicholas. In 1909 the family moved to Blagoveschensk-on-Amur in the Far East, where the future hierarch finished high school. In a sermon at his nomination as Bishop of Brisbane, the future metropolitan said: “There is hardly anything specially worthy of note in my life, in its childhood and young years, except, perhaps, a recollection from my early childhood years, when I as a small child of six or seven years in a childishly naïve way loved to ‘play service’ – I made myself a likeness of a Church vestment and ‘served’. And when my parents began to forbid me to do this, Vladyka Evgeny, the Bishop of Blagoveschensk, after watching this ‘service’ of mine at home, to their amazement firmly stopped them: ‘Leave him, let the boy “serve” in his own way. It is good that he loves the service of God.’” In this way was the saint’s future service in the Church foretold in a hidden way already in his childhood. In 1920 the family was forced to flee from the revolution into Manchuria, to the city of Harbin. There, in 1921, George’s mother, Lydia Vasilievna, died, after which his father, Fr. Nicholas took the monastic tonsure with the name Demetrius and became Archbishop of Hailar. Vladyka Demetrius was a learned theologian, the author of a series of books on the history of the Church and other subjects. In 1927 George graduated from the Russo-Chinese Polytechnical institute and received a specialist qualification as an engineer-electrical mechanic. Later, when he was already First Hierarch of the Russian Church Outside Russia (ROCOR), he did not forget his friends at the institute. All those who had known him, both at school and in the institute, remembered him as a kind, affectionate comrade. He was distinguished by his great abilities and was always ready to help. After the institute he got a job as a teacher; he was a good instructor, and his pupils loved and valued him. But his instructions for the young people went beyond the bounds of the school programme and penetrated every aspect of human life. Many of his former pupils and colleagues after meeting him retained a high estimate of him for the rest of their lives. Living in the family of a priest, the future metropolitan naturally became accustomed, from his early years, to the church and the Divine services. But, as he himself said later, at the beginning there was in this “almost nothing deep, inwardly apprehended and consciously accepted”. In 1931 George completed his studies in Pastoral Theology in what was later renamed the theological faculty of the Holy Prince Vladimir Institute. In this faculty he became a teacher of the New Testament, pastoral theology and homiletics. In 1936 his book, Outline of the Law of God, was published in Harbin. In 1930 he was ordained to the diaconate, and in 1931 – to the priesthood, serving as the priest George. In the same year he was tonsured into monasticism with the name Philaret in honour of Righteous Philaret the Merciful. In 1933 he was raised to the rank of igumen, and in 1937 - to the rank of archimandrite. In his early years as a priest, Fr. Philaret was greatly helped by the advice of the then First-Hierarch of ROCOR, Metropolitan Anthony (+1936), with whom he corresponded for several years. “The Orthodox Church is now glorifying all those who have pleased God, all the saints…, who accepted the holy word of Christ not as something written somewhere to someone for somebody, but as written to himself; they accepted it, took it as the guide for the whole of their life and fulfilled the commandments of Christ. “… Of course, their life and exploit is for us edification, they are an example for us, but you yourselves know with what examples life is now filled! Do we now see many good examples of the Christian life?!…. When you see what is happening in the world,… you involuntarily think that a man with a real Orthodox Christian intention is as it were in a desert in the midst of the earth’s teeming millions. They all live differently… Do you they think about what awaits them? Do they think that Christ has given us commandments, not in order that we should ignore them, but in order that we should try to live as the Church teaches. “…. We have brought forward here one passage from the Apocalypse, in which the Lord says to one of the servers of the Church: ‘I know your works: you are neither cold nor hot. Oh if only you were cold or hot!” We must not only be hot, but must at least follow the promptings of the soul and fulfil the law of God. Fr. Philaret was very active in ecclesiastical and pastoral-preaching work. Already in the first years of his priesthood he attracted many people seeking the spiritual path. The Divine services which he performed with burning faith, and his inspired sermons brought together worshippers and filled the churches. Multitudes pressed to the church in which Fr. Philaret was serving. All sections of the population of Harbin loved him; his name was also known far beyond the boundaries of the Harbin diocese. He was kind and accessible to all those who turned to him. Queues of people thirsting to talk with him stood at the doors of his humble cell; on going to him, people knew that they would receive correct advice, consolation and help. Fr. Philaret immediately understood the condition of a man’s soul, and, in giving advice, consoled the suffering, strengthened the despondent and cheered up the despairing with an innocent joke. He loved to say: “Do not be despondent, Christian soul! There is no place for despondency in a believer! Look ahead – there is the mercy of God!” People went away from him pacified and strengthened by his strong faith. In imitation of his name-saint. Fr. Philaret was generous not only in spiritual, but also in material alms, and secretly gave help to the needy. Many homeless people turned to him, and he refused help to nobody, except in those cases in which he literally had nothing left, when he would smile guiltily and say: “Nothing, my dear!” But then he would find a way out – and give away the things he was wearing. Following the example of the holy fathers, Fr. Philaret did not teach others what he himself did not do. He himself, like the saints, whom he called on people to imitate, accepted everything written in the Holy Scriptures and the patristic writings “not as something written somewhere to someone for somebody,”, but as a true guide to life. He was exceptionally strict with himself and conducted a truly ascetic style of life. He had a rare memory, keeping in his head not only the words of the Gospel and the holy fathers, but also the sorrows and woes of his flock. On meeting people the holy hierarch demonstrated great interest in all sides of their life, he did not need to remember their needs and difficulties – he himself developed the subject of conversation that interested a man, and gave ready replies to the perplexities tormenting him. From 1931 until 1945 Manchuria with its capital city of Harbin was occupied by the Japanese. Towards the end of this period the Russians were called upon to confess their faith; for the Japanese placed a statue of their goddess Amateras, who according to Japanese tradition was the foundress of the imperial race, directly opposite the Orthodox cathedral of St. Nicholas. Then, in May, 1943, they demanded that Russians going to church in the cathedral should first make a “reverential bow” towards the goddess. It was also required that on certain days Japanese temples should be venerated, while a statue of the goddess was to be put in Orthodox churches. The question of the admissibility of participating in such ritual venerations was discussed at the diocesan assemblies of the Harbin diocese on September 8 and October 2, 1943, in the presence of the hierarchs of the Harbin diocese: Metropolitan Meletius, Bishop Demetrius and Bishop Juvenal (Archbishop Nestor was not present). According to the witness of the secretary of the Episcopal conference, Fr. Leonid Upshinsky, “the session was stormy, since some objected that… Amateras was not a goddess but the Ancestress.” It was decided “to accept completely and direct to the authorities” the reports of Bishop Demetrius of Hailar and Professor K.I. Zaitsev (the future Archimandrite Constantine), which expressed the official view of the episcopate that participation in the ritual venerations was inadmissible. However, on February 5, 1944 the congress of leaders of the Russian emigration in Manchuria met in Harbin. The congress opened with a moleben in the St. Nicholas cathedral, after which the participants went to the Japanese temple “Harbin-Jinjya”, where they carried out a veneration of the goddess Amateras. On February 12 the Harbin hierarchs responded with a archpastoral epistle, in which they said: “Since any kind of veneration of pagan divinities and temples is forbidden by the commandments of God…, Orthodox Christians, in obedience to the will of God and his Law, cannot and must not carry out this veneration, for such venerations contradict the basic theses of the Orthodox Faith.” Archbishop Nestor refused to sign this epistle. In March both vicars of the Harbin diocese, Bishop Demetrius and Bishop Juvenal, were summoned to the police, where they were closely interrogated about the circumstances of the illegal distribution of the archpastoral epistle and about the attitude of the flock to this question. On April 28 Metropolitan Meletius was subjected to interrogation. The conversation, which lasted for several hours, produced no result. Referring to his extreme exhaustion and illness, Vladyka Meletius asked that the conversation be continued on May 1. This again produced no result. Bishop Demetrius, who also took part, categorically and sharply protested against the venerations. On May 2, an Episcopal Convention took place (Archbishop Nestor, as usual, was not present), at which this position was confirmed. Several days later, Metropolitan Meletius presented the text of the Episcopal Convention to Mr. Kobayasi. Kobayasi demanded that he give a written promise not to raise the question of venerations until the end of the war. Metropolitan Meletius asked that the words “if there will be no compulsion to venerations” should be added to the text. Vladyka’s demand again elicited a quarrel. However, in the end Kobayasi gave in. On August 31 the Harbin archpastors sent a letter to Archbishop Nestor in which they appealed to him “to unite with us, return and may your voice sound out in defence of the purity of the Faith and zeal for its confession. Sign (better late than never) our Archpastoral Epistle and announce this publicly – in whatever way and place you can.” In reply, Vladyka Nestor wrote that he did not disagree with his brother archpastors about the inadmissibility of venerating the temples of Amateras. An important influence on the Japanese in their eventual climb-down was the courageous confession of Fr. Philaret. The Japanese seized him and subjected him to torture. His cheek was torn and his eyes were almost torn out, but he suffered this patiently. Then they told him: “We have a red-hot electrical instrument here. Everybody who has had it applied to them has agreed to our requests. And you will also agree.” The torturer brought the instrument forward. Then Fr. Philaret prayed to St. Nicholas: “Holy Hierarch Nicholas, help me, otherwise there may be a betrayal.” The torturer commenced his work. He stripped the confessor to his waist and started to burn his spine with the burning iron. Then a miracle took place. Fr. Philaret could smell his burning flesh, but felt no pain. He felt joyful in his soul. The torturer could not understand why he was silent, and did not cry out or writhe from the unbearable pain. Then he turned and looked at his face. Amazed, he waved his hand, muttered something in Japanese and fled, conquered by the superhuman power of the confessor’s endurance. Fr. Philaret was brought, almost dead, to his relatives. There he passed out. When he came to he said: “I was in hell itself.” Gradually his wounds healed. Only his eyes were a bit distorted. And the Japanese no longer tried to compel the Orthodox to bow down to their idol. In 1945 the Soviet armies defeated the Japanese army; later the Chinese communists took control of Manchuria. In the first days of the “Soviet coup” the Soviets began to offer Russian émigrés the opportunity to take Soviet passports. Their agitation was conducted in a skilful manner, very subtly and cleverly, and the deceived Russian people, exhausted from the hard years of the Japanese occupation during which everything Russian had been suppressed, believed that in the USSR there had now come “complete freedom of religion”, and they began to take passports en masse. 50,000 Russian citizens of Harbin, and every third young person, fell into the snare. The reality was soon revealed to them. At Atpor station 14,000 people were shot, and the remaining 36,000 were deported to concentration camps, where most of them perished of hunger and other privations. Soon Fr. Philaret read in the Journal of the Moscow Patriarchate that Lenin was the supreme genius and benefactor of mankind. Fr. Philaret could not stand this lie and from the ambon of the church he indicated to the believers the whole unrighteousness of this disgraceful affirmation in an ecclesiastical organ, emphasising that Patriarch Alexis (Simansky), as the editor of the JMP, was responsible for this lie. Fr. Philaret’s voice sounded alone: none of the clergy supported him, and from the diocesan authorities there came a ban on his preaching from the church ambon, under which ban he remained for quite a long time. Thus, while still a priest, he was forced to struggle for church righteousness on his own, without finding any understanding amidst his brothers. Practically the whole of the Far Eastern episcopate of the Russian Church Abroad at that time recognised the Moscow Patriarchate, and so Fr. Philaret found himself involuntarily in the jurisdiction of the MP, as a cleric of the Harbin diocese. This was for him exceptionally painful. He never, in whatever parish he served, permitted the commemoration of the atheist authorities during the Divine services, and he never served molebens or pannikhidas on the order of, or to please, the Soviet authorities. But even with such an insistent walling-off from the false church, his canonical dependence on the MP weighed as a heavy burden on his soul. When the famous campaign for “the opening up of the virgin lands” was declared in the USSR, the former émigrés were presented with the opportunity to depart for the Union. To Fr. Philaret’s sorrow, in 1947 his own father, Archbishop Demetrius of Hailar, together with several other Bishops, were repatriated to the USSR. But Fr. Philaret, on his own as before, tirelessly spoke in his flaming sermons about the lie implanted in the MP and in “the country of the soviets” as a whole. Not only in private conversations, but also from the ambon, he explained that going voluntarily to work in a country where communism was being built and religion was being persecuted, was a betrayal of God and the Church. He refused outright to serve molebens for those departing on a journey for those departing for the USSR, insofar as at the foundation of such a prayer lay a prayer for the blessing of a good intention, while the intention to go to the Union was not considered by Fr. Philaret to be good, and he could not lie to God and men. That is how he spoke and acted during his life in China. As he himself recounted the story, at two o’clock on a Sunday morning Fr. Philaret got up from bed because of a strange smell in his house. He went to the living-room, in the corner of which was a larder. From under the doors of the larder there was coming out smoke with a sharp, corrosive smell. Then he went to the lavatory, poured water into a bowl, returned to the larder and, opening the doors, threw the water in the direction of the smoke. Suddenly there was an explosion and a flash. The fire burned him, while the wave of the explosion lifted him up and hurled him with enormous force across the whole length of the living-room and against the door leading out. Fortunately, the door opened outwards: from the force of his flying body the bolts were broken, and he fell on the ground deafened but alive. On coming to, he saw the whole of his house on fire like a torch. He understood that the explosion had been caused by a thermal bomb set to go off and burn down the house at a precise time. During this night, at about midnight, a certain Zinaida Lvovna, one of the sisters of the church of the House of Mercy, came out of her house, which was situated opposite the church across the street, and saw some fire engines in the street near the church – but there was no fire. This unusual concourse of fire engines surprised her. About two hours later, when the sound of the bomb awoke her, she immediately went out into the street and saw the fire, which the fire-fighters had already managed to put out. Fr. Philaret was standing on the threshold of the church shaking from the cold and suffering from burns and concussion. Zinaida Lvovna immediately understood that the fire had been started by the communists with the purpose of killing Fr. Philaret. She quickly crossed the street and invited him to enter her house. But the Chinese firemen, on seeing Archimandrite Philaret alive, accused him of starting the fire and wanted to arrest him. However, the quick-witted Zinaida Lvovna quickly turned to the chief fireman and said: “It looks like you put your fire engines here in advance, knowing that a fire was about to begin. Who told you beforehand that about the fire?” The fire chief was at a loss for words and could not immediately reply. Meanwhile, Zinaida Lvovna and Fr. Philaret went into her house. She put him in a room without windows because she knew that the communists might enter through a window and kill him. The next day, some young people came early to the Sunday service, but the church was closed, and the house in which Fr. Philaret lived was burned to the ground. The twenty-year-old future pastor, Fr. Alexis Mikrikov came and learned from Zinaida Lvovna what had happened during the night. He asked to see Fr. Philaret. Immediately he saw that the saint was extremely exhausted and ill. His burned cheek was dark brown in colour. But the look in his eyes was full of firm submission to the will of God and joyful service to God and men. Suddenly Fr. Alexis heard him say: “Congratulations on the feast!” as he would say “Christ is risen!” Tears poured down the face of Fr. Alexis in reply. He had not wept since his childhood, and here he was, a twenty-year-old man, on his knees before the confessor, weeping and kissing his hand. As a consequence of the interrogations and burns he suffered, for the rest of his life Fr. Philaret retained a small, sideways inclination of his head and a certain distortion of the lower part of his face; his vocal chords also suffered. Two months passed. Fr. Philaret again began to serve, and within half a year he was able to live on his own in a separate maisonette above the church. But then he again went to Zinaida Lvovna. The reason was that he had gone into his cell after the service, but suddenly saw two big boots sticking out from under the curtain. Understanding that an assassin sent by the communists was standing there, he went to the chest of drawers, took something out to divert attention, and then quickly left the cell, locking it behind him. After this a Chinese policeman came to Zinaida Lvovna and asked her why Archimandrite Philaret did not sleep in his cell. She immediately understood what he was on about, and replied: because of his physical weakness. Archimandrite Philaret left China in 1961, only after almost the whole of his flock had left Harbin. On March 29, 1962 the Hierarchical Synod of the Russian Church Abroad “heard a letter of Archimandrite Philaret (Voznesensky) to the president of the Synod on his arrival in Hong Kong and his repentance over the fact that in 1945 he had entered the jurisdiction of the Moscow Patriarchate, and also a penitential declaration signed by him in accordance with the form established by the Council of Bishops” in 1959. The form in question was as follows: “I, the undersigned, a former clergyman of the Moscow Patriarchate, ordained to the rank of deacon (by such-and-such a bishop in such-and-such a place at such-and-such a time) and ordained to the rank of presbyter (by such-and-such a bishop in such-and-such a place at such-and-such a time) and having passed through my service (in such-and-such parishes), petition that I be received into the clergy of the Russian Orthodox Church Abroad. “I am sincerely sorry that I was among the clergy of the Moscow Patriarchate, which is in union with the God-fighting authorities. “While striving to guard my flock from Soviet falsehood and lies,” recounted the saint, “I myself sometimes felt inexpressibly oppressed – to the point that I several times came close to the decision to leave altogether – to cease serving. And I was stopped only by the thought of my flock: how could I leave these little ones? If I went and stopped serving, that would mean that they would have to enter into service to the Soviets and hear prayers for the forerunners of the Antichrist – ‘Lord, preserve them for many years,’ etc. This stopped me and forced me to carry out my duty to the end. Soon Fr. Philaret flew to Australia and arrived in Sydney. The ruling Archbishop of Australia accepted him with joy and love, and already in the first weeks of Fr. Philaret’s stay in Australia began to speak about the possibility of ordaining him as a Bishop. Archimandrite Philaret considered himself weak and unworthy of such a lofty service. However, the experience of monastic obedience did not allow him to decline from the path to which ecclesiastical authority summoned him. In 1963 he was ordained Bishop of Brisbane, a vicariate of the Australian diocese. On May 14/27, 1964, having been for many years First Hierarch of ROCOR, Metropolitan Anastasy, for reasons of health and age, petitioned the Hierarchical Council for his retirement. The question arose who would be the new First Hierarch. Some members of ROCOR wanted to see the holy Hierarch John (Maximovich) as their head, but another part was very opposed to this. Then, to avoid any further aggravation of the situation, and a possible scandal and even schism, the Hierarch John removed his candidacy and suggested making the youngest Hierarch, Bishop Philaret, First Hierarch. This choice was supported by Metropolitan Anastasy: Vladyka Philaret was the youngest by ordination, had mixed little in Church Abroad circles, and had not managed to join any “party”. And so Bishop Philaret of Brisbane was elected to the First Hierarchical see by the Hierarchical Council of ROCOR, and was enthroned by Metropolitan Anastasy himself in a service that, for the first time in centuries, used the ancient text for the enthroning of a metropolitan of Moscow. “In recent days the Soviet Government in Moscow and various parts of the world celebrated a new anniversary of the October Revolution of 1917 which brought it to power. “We, on the other hand, call to mind in these days the beginning of the way of the cross for the Russian Orthodox Church, upon which from that time, as it were, all the powers of hell have fallen. “Meeting resistance on the part of Archpastors, pastors, and laymen strong in spirit, the Communist power, in its fight with religion, began from the very first days the attempt to weaken the Church not only by killing those of her leaders who were strongest in spirit, but also by means of the artificial creation of schisms. Thus arose the so-called ''Living Church" and the renovationist movement, which had the character of a Church tied to a Protestant-Communist reformation. Notwithstanding the support of the Government, this schism was crushed by the inner power of the Church. It was too clear to believers that the ‘Renovated Church’ was uncanonical and altered Orthodoxy. For this reason people did not follow it. failures. What can be more blasphemous than such an idea, which was justly appraised by many at that time as an attempt to unite light with darkness, and Christ with Belial. Both Patriarch Tikhon and Metropolitan Peter, as well as others who served as locum tenens of the Patriarchal throne, had earlier refused to sign a similar declaration, for which they were subjected to arrest, imprisonment, and banishment. “Protesting against this declaration—which was proclaimed by Metropolitan Sergius by himself alone, without the agreement of the suppressed majority of the episcopate of the Russian Church, violating thus the 34th Apostolic Canon—many bishops who were then in the death camp at Solovki wrote to the Metropolitan: ‘Any government can sometimes make decisions that are foolish, unjust, cruel, to which the Church is forced to submit, but which she cannot rejoice over or approve. One of the aims of the Soviet Government is the extirpation of religion, but the Church cannot acknowledge its successes in this direction as her own successes’ (Open Letter from Solovki, September 27, 1927). “The courageous majority of the sons of the Russian Church did not accept the declaration of Metropolitan Sergius, considering that a union of the Church with the godless Soviet State, which had set itself the goal of annihilating Christianity in general, could not exist on principle. “The majority, renouncing the declaration, began an illegal ecclesiastical existence. Almost all the bishops were tortured and killed in death camps, among them the locum tenentes Metropolitan Peter and Metropolitan Cyril of Kazan, who was respected by all, and Metropolitan Joseph of Petrograd, who was shot to death at the end of 1938, as well as many other bishops and thousands of priests, monks, nuns, and courageous laymen. Those bishops and clergy who miraculously remained alive began to live illegally and to serve Divine services secretly, hiding themselves from the authorities and originating in this fashion the Catacomb Church in the Soviet Union. “Little news of this Church has come to the free world. The Soviet press long kept silent about her, wishing to give the impression that all believers in the USSR stood behind the Moscow Patriarchate. They even attempted to deny entirely the existence of the Catacomb Church. “But then, after the death of Stalin and the exposure of his activity, and especially after the fall of Khrushchev, the Soviet press has begun to write more and more often on the secret Church in the USSR, calling it the ‘sect’ of True-Orthodox Christians. It was apparently impossible to keep silence about it any longer; its numbers are too great and it causes the authorities too much alarm. “Unexpectedly in the Atheist Dictionary (Moscow, 1964), on pages 123 and 124 the Catacomb Church is openly discussed. '’True-Orthodox Christians,’ we read in the Dictionary, ‘an Orthodox sect, originating in the years 1922-24. It was organized in 1927, when Metropolitan Sergius proclaimed the principle of loyalty to the Soviet power.’ ‘Monarchist’ (we would say ecclesiastical) ‘elements, having united around Metropolitan Joseph (Petrovykh) of Leningrad' (Petrograd) — the Josephites,’ or, as the same Dictionary says, the Tikhonites, formed in 1928 a guiding centre, the True-Orthodox Church, and united all groups and elements which came out against the Soviet order’ (we may add from ourselves, ‘atheist’ order). ‘The True-Orthodox Church directed unto the villages a multitude of monks and nuns,’ for the most part of course priests, we add again from ourselves, who celebrated Divine services and rites secretly and ‘conducted propaganda against the leadership of the Orthodox Church,’ i.e, against the Moscow Patriarchate which had given in to the Soviet power, ‘appealing to people not to submit to Soviet laws,’ which are directed, quite apparently, against the Church of Christ and faith. By the testimony of the Atheist Dictionary, the True-Orthodox Christians organized and continue to organize house, 'i.e., secret, catacomb churches and monasteries... preserving in full the doctrine and rites of Orthodoxy.’ They ‘do not acknowledge the authority of the Orthodox Patriarch,’ i.e., the successor of Metropolitan Sergius, Patriarch Alexis. “’Striving to fence off’ the True-Orthodox Christians ‘from the influence of Soviet reality,’ chiefly of course from atheist propaganda, ‘their leaders... make use of the myth of Antichrist, who has supposedly been ruling in the world since 1917.’ The anti-Christian nature of the Soviet power is undoubted for any sound-thinking person, and all the more for a Christian. “True Orthodox Christians ‘usually refuse to participate in elections,’ which in the Soviet Union, a country deprived of freedom, are simply a comedy, ‘and other public functions; they do not accept pensions, do not allow their children to go to school beyond the fourth class...’ Here is an unexpected Soviet testimony of the truth, to which nothing need be added. “Honour and praise to the True-Orthodox Christians, heroes of the spirit and confessors, who have not bowed before the terrible power, which can stand only by terror and force and has become accustomed to the abject flattery of its subjects. The Soviet rulers fall into a rage over the fact that there exist people who fear God more than men. They are powerless before the millions of True-Orthodox Christians. “However, besides the True Orthodox Church in the Soviet Union and the Moscow Patriarchate, which have communion neither of prayer nor of any other kind with each other, there exists yet a part of the Russian Church—free from oppression and persecution by the atheists the Russian Orthodox Church Outside of Russia. She has never broken the spiritual and prayerful bonds with the Catacomb Church in the home land. After the last war many members of this Church appeared abroad and entered into the Russian Church Outside Russia, and thus the bond between these two Churches was strengthened yet more—a bond which has been sustained illegally up to the present time. As time goes on, it becomes all the stronger and better established. “The part of the Russian Church that is abroad and free is called upon to speak in the free world in the name of the persecuted Catacomb Church in the Soviet Union; she reveals to all the truly tragic condition of believers in the USSR, which the atheist power so carefully hushes up, with the aid of the Moscow Patriarchate, she calls on those who have not lost shame and conscience to help the persecuted. Russian Church and false conclusions concerning her present condition. May God forgive them this, since they do not know what they are doing. “We shall not cease to accuse the godless persecutors of faith and those who evilly cooperate with them under the exterior of supposed representatives of the Church. In this the Russian Church Outside of Russia has always seen one of her important tasks. Knowing this, the Soviet power through its agents wages with her a stubborn battle, not hesitating to use any means: lies, bribes, gifts, and intimidation. We, however, shall not suspend our accusation. While Metropolitan Philaret was first-hierarch, ecumenism finally showed its true face – the mask of a terrible heresy uniting in itself all the earlier heresies and striving to engulf Orthodoxy completely, destroying the very concept of the Church of Christ and creating a universal “church” of the antichrist. An important turning-point came in 1964, when, in defiance of the holy canons, Pope Paul VI and Patriarch Athenagoras of Constantinople prayed together in Jerusalem, and in December, 1965 they “lifted the anathemas” placed by the Roman and Constantinopolitan Churches on each other in 1054. In his second Epistle, written in 1969, Metropolitan Philaret said that he had decided to turn to all the hierarchs, “some of whom occupy the oldest and most glorious sees”, because, in the words of St. Gregory the Theologian, “the truth is betrayed by silence”, and it is impossible to keep silent when you see a deviation from the purity of Orthodoxy – after all, every bishop at his ordination gives a promise to keep the Faith and the canons of the holy fathers and defend Orthodoxy from heresies. The holy metropolitan quoted various ecumenist declarations of the World Council of Churches (WCC) and clearly showed, on the basis of the patristic teaching and the canons, that the position of the WCC had nothing in common with Orthodoxy, and consequently the Orthodox Churches should not participate in the work of this council. He also emphasised that the voice of the MP was not the voice of the True Russian Church, which was persecuted and concealed itself in the catacombs. He called on all the Orthodox hierarchs to stand up in defence of the purity of Orthodoxy. The metropolitan wrote a third “Sorrowful Epistle” on the Sunday of Orthodoxy, 1972. In it he noted that although in the last two years hierarchs had made declarations about the heterodoxy of the ecumenical movement, not one Orthodox Church had declared that it was leaving the WCC. His aim in writing this fresh epistle was “to show that abyss of heresy against the very concept of the Church into which all the participants in the ecumenical movement are being drawn”. He recalled the threatening prophecy of the Apostle Paul that to those who will not receive “the love of the truth for salvation” the Lord will send “strong delusion, that they should believe a lie. That they all might be damned who believed not the truth, but had pleasure in unrighteousness” (II Thessalonians 2.10-12). A fourth Epistle, written in 1975, was devoted to the so-called “Thyateira Confession” of Metropolitan Athenagoras [of Thyateira and Great Britain], the exarch of the Constantinopolitan Patriarchate in Europe – a document written in a completely heretical spirit, but which did not elicit any reaction from the leaders of the official churches. Evidently Metropolitan Philaret hoped at the beginning that at any rate one of the bishops of ‘World Orthodoxy’ might listen to his words, which is why he addressed them in his epistles as true Archpastors of the Church. Besides, attempts at exhortation corresponded to the apostolic command: ‘A man that is a heretic after the first and second admonition reject, knowing that he that is such is subverted, and sinneth, being condemned of himself’ (Titus 3. 10-11). It was fitting, before accepting an anathema against the apostates, to try and convert them from their error. In addition to issuing his “Sorrowful Epistles”, Metropolitan Philaret and his Synod took concrete measures to guard his flock against the heresy of ecumenism. It was especially necessary to make clear that Catholics and Protestants were not inside the True Church. And so in 1971 it was decreed that all Catholics and Protestants coming to the Orthodox Church should be received by full threefold immersion baptism. This re-establishment of the canonical norms in relation to the reception of heretics increased the prestige of ROCOR among all those seeking the truth of Orthodoxy, and many converts from western confessions, as well as Orthodox from other, ecumenical jurisdictions, sought refuge in the ROCOR. By the 1970s ROCOR under Metropolitan Philaret’s leadership was not only a global jurisdiction geographically, but was well on the way to becoming global in its membership, too. While rebuking the apostasy of the “World Orthodox” who took part in the World Council of Churches, Metropolitan Philaret was zealous to establish relations with other truly confessing Churches. Thus in December, 1969, under his leadership, the Synod of ROCOR officially recognised the validity of the ordinations of the “Florinite” branch of the Greek Old Calendarists. And in September, 1971 communion was also established with the “Matthewite” branch of the same Church. On September 20, 1975, Metropolitan Philaret wrote to Metropolitan Epiphanius of Kition, the leader of the Old Calendarist Church of Cyprus: “From the beginning our Russian Church has known that the calendar innovation was unacceptable, and has not dared to move this boundary set by patristic tradition, for the Ecclesiastical Calendar is a support of the life of the Church and as such is fortified by decrees of Holy Tradition. “However, it is obvious to all that the calendar innovation caused a schism in the Greek Church in 1924, and the responsibility for the schism weighs exclusively on the innovators. This is the conclusion that will be reached by anyone studying the Patriarchal Tomoi (as that of 1583) and taking into account the wretched and self-evident fact of the schism and the frightful punishments, persecutions and blasphemies which those who have cleaved to the patristic piety of Holy Tradition have undergone. The decision of the MP to give communion to Catholics put the other Russian jurisdiction in North America, the American Metropolia, into a difficult position; for in the early 1960s the Metropolia (a body in schism from ROCOR since 1946) had been, through Fr. Georges Florovsky, among the most conservative participants in the ecumenical movement. However, this Church had been secretly negotiating with the Moscow Patriarchate for a grant of autocephaly. According to the deal eventually agreed upon, the patriarchate was to declare the Metropolia to be the autocephalous Orthodox Church of America (OCA) in exchange for the Japanese parishes of the Metropolia coming within the jurisdiction of the patriarchate. And yet the MP’s parishes in America did not pass into the OCA, but remained directly under the patriarchate! This deal, which was recognized by none of the Local Churches and was to the advantage, in the long run, only of the MP and the KGB (it was engineered by the KGB General Metropolitan Nikodim of Leningrad), was made public in December, 1969 – just at the moment that the patriarchate announced that it had entered into partial communion with the Catholics. Thus the former Metropolia found that it had been granted autocephaly by a Church that was now in communion with the Catholics. Naturally, this dealt a death blow to such anti-ecumenist opinion as still existed in that Church. In 1971 the ROCOR Council of Bishops passed over the heretical aspect of the matter, and concentrated on the illegality of the church that had given the autocephaly: “The Council of Bishops, having listened to the report of the Synod of Bishops concerning the so-called Metropolia’s having received autocephaly from the Patriarchate of Moscow, approves all the steps taken in due course by the Synod of Bishops to convince Metropolitan Irenaeus and his colleagues of the perniciousness of a step which deepens the division which was the result of the decision of the Cleveland Council of 1946 which broke away from the Russian Orthodox Church Outside of Russia. “The American Metropolia has received its autocephaly from the Patriarchate of Moscow, which has not possessed genuine canonical succession from His Holiness Patriarch Tikhon from the time when Metropolitan Sergius, who later called himself Patriarch, violated his oath with regard to Metropolitan Peter, the locum tenens of the patriarchal throne, and set out upon a path which was then condemned by the senior hierarchs of the Church of Russia. Submitting all the more to the commands of the atheistic, anti-Christian regime, the Patriarchate of Moscow has ceased to be that which expresses the voice of the Russian Orthodox Church. For this reason, as the Synod of Bishops has correctly declared, none of its acts, including the bestowal of autocephaly upon the American Metropolia, has legal force. Furthermore, apart from this, this act, which affects the rights of many Churches, has elicited definite protests on the part of a number of Orthodox Churches, who have even severed communion with the American Metropolia. Here the metropolitan was hinting that faithfulness to the dogma of the One Church was not compatible with communion with World Orthodoxy”, the Local Orthodox Churches that participated in the ecumenical movement. However, such a vision of ROCOR was not shared by all her hierarchs. Some saw the isolation of ROCOR from other local Churches as necessitated, not so much by the struggle against ecumenism, as by the need to preserve Russianness among the Russian émigrés. They had passively acquiesced in Metropolitan Philaret’s “Sorrowful Epistles”, and in the union with the Greek Old Calendarists. But they began to stir when the consequences of this were spelled out by the “zealots” in ROCOR: no further communion with the new calendarists, the Serbs and Jerusalem. The unofficial leader of this group of bishops turned out to be Archbishop Anthony of Geneva, who was supported by Bishop Laurus of Manhattan, Archbishop Philotheus of Germany and Bishop Paul of Stuttgart. The second, of the same date, is called “Resolution of the Russian Orthodox Church Outside of Russia Concerning the Election of Pimen (Izvekov) as Patriarch of Moscow”: “All of the elections of Patriarchs in Moscow, beginning in 1943, are invalid on the basis of the 30th Canon of the Holy Apostles and the 3rd Canon of the 7th Ecumenical Council, according to which, ‘if any bishop, having made use of secular rulers, should receive through them Episcopal authority in the Church, let him be defrocked and excommunicated along with all those in communion with him’. The significance that the Fathers of the 7th Council gave to such an offence is obvious from the very fact of a double punishment for it, that is, not only deposition but excommunication as well, something unusual for ecclesiastical law. The famous commentator on Canon Law, Bishop Nicodemus of Dalmatia, gives the following explanation of the 30th Canon of the Holy Apostles: ‘If the Church condemned unlawful influence by the secular authorities in the ordination of bishops at a time when the rulers were Christians, then it follows that She should condemn such action all the more when the latter are pagans and place even heavier penalties on the guilty parties, who were not ashamed of asking for help from pagan rulers and the authorities subordinated to them, in order to gain the episcopate. This (30th) Canon has such cases in view’. If in defence of this position examples are given of the Patriarchs of Constantinople who were placed on the Throne at the caprice of the Turkish Sultans, one can reply that no anomaly can be regarded as a norm and that one breach of Canon Law cannot justify another. However, ROCOR’s attitude to the MP was complicated by the phenomenon known as “the dissident movement” in the Soviet Union. The dissidents were courageous opponents of the Soviet regime and supporters of human rights whose activity affected both the political sphere (for example, Sakharov and Solzhenitsyn) and the religious sphere (Solzhenitsyn again, the priests Eshliman, Yakunin and Dudko, the layman Boris Talantov). One of the most famous dissidents, Alexander Solzhenitsyn, had been expelled from the Soviet Union in 1974 and now turned up at ROCOR’s All-Diaspora Council, although he was a member of the MP, at the invitation of Archbishop Anthony of Geneva. He promptly created a sensation by declaring that he did not believe in the existence of the Catacomb Church. He supported ROCOR’s independent stance, but opposed any condemnation of the MP as graceless. This position eminently suited those hierarchs of ROCOR, such as Anthony of Geneva, whose attitude to events in Russia was dictated as much by political as by spiritual or ecclesiological considerations (many West European members of ROCOR, such as the future Archbishop Mark of Berlin, belonged to the NTS, a secret anti-communist political party which was infiltrated by both the KGB and the CIA). They were sincere anti-communists and despised the kowtowing of the MP hierarchs to communism, but would not have dreamed of denying that the MP was a true Church. In other words, their opposition to the MP was political and patriotic rather than strictly ecclesiastical and dogmatic. Taking the opportunity presented by Solzhenitsyn’s speech, Archbishop Anthony of Geneva read a report calling on ROCOR to support the dissidents, in spite of the fact that they were ecumenists and in the MP. He was countered by Archbishop Anthony of Los Angeles, who, while respecting the courage of the dissidents, objected to a recognition of them that would devalue the witness of the true catacomb confessors by giving the impression that it is possible to be a true confessor from within a heretical church organization. Also, Metropolitan Philaret moved for an official statement that the MP was graceless. According to the witness of a seminarian present at the Council, the majority of bishops and delegates would have supported such a motion. However, at the last minute the metropolitan was persuaded not to proceed with the motion on the grounds that it would have caused a schism. Voices were heard at the 1974 Council arguing for union not only between the ROCOR and MP dissidents, but also between ROCOR and the Paris and American Metropolia (Orthodox Church of America) jurisdictions. Love, they said, should unite us, and we should not emphasize our differences. But Metropolitan Philaret pointed out that love which does not wish to disturb our neighbour by pointing out his errors is not love but hatred! He continued to regard the Paris and American jurisdictions as schismatic, and did not allow intercommunion with them. This was in accordance with his profoundly felt conviction that there is only One True Church. Another important dissident was the Moscow priest Fr. Demetrius Dudko, who conducted open meetings in his church that attracted many and influenced many more. Unlike Solzhenitsyn, he knew of the Catacomb Church, and wrote of it in relatively flattering terms. However, Fr. Demetrius was infected with ecumenist and liberal ideas, which, of course, he communicated to his followers. The right attitude to him would have been to applaud his courage and the correct opinions he expressed, while gently seeking to correct his liberalism and ecumenism. In no way was it right to treat him as if he were a true priest in the True Church, and an example to be followed that was no less praiseworthy than those of the true confessors in the catacombs. But that is precisely what many in ROCOR, led by Archbishop Anthony of Geneva, now began to do. However, in 1980, Fr. Demetrius was arrested, which was closely followed by the arrest of his disciples Victor Kapitanchuk and Lev Regelson. Then Dudko issued a recantation on Soviet television in which he confessed that his “so-called struggle with godlessness” was in fact “a struggle with Soviet power”. Regelson confessed to having “criminal ties” with foreign correspondents and of mixing religious activity with politics, while Kapitanchuk also confessed to links with Western correspondents, saying that he had “inflicted damage on the Soviet state for which I am very sorry”. Both men implicated others in their “crimes”. Metropolitan Philaret had been proved right – although many continued to justify Dudko and denounced the zealots for “judging” him. But it was not a question of “judging”, and nobody rejoiced in the fall of the dissident. It was a question of the correct discerning of the boundaries of the Church and the correct attitude to those struggling outside it. Another important cause of conflict between Metropolitan Philaret and Archbishop Anthony of Geneva was the issue of relations with the Serbian Church. The Serbs had joined the WCC in 1965 and were as fully under the control of the communists as the MP. In spite of this, Archbishop Anthony continued to serve with the Serbs in his West European diocese, citing the pre-war hospitality of the Serbs to ROCOR in his justification. He also continued to serve with the new calendarists, which led to several parishes leaving his diocese, and to the Matthewite Greek Old Calendarists breaking communion with ROCOR in 1976. In connection with the Serbian issue Metropolitan Philaret wrote to him: “I consider it my duty to point out to you, Vladyka, that your assertion that we must thank the Serbian Church for her treatment of us, I fully accept, but only as regards her past – the glorious past of the Serbian Church. Yes, of course, we must holy the names of their Holinesses Patriarchs Demetrius and Barnabas in grateful memory for their precious support of the Church Abroad at that time when she had no place to lay her head. “There is no denying that a certain honour is due the Serbian Church for her refusing to condemn our Church Abroad at the parasynagogue in Moscow in 1971, and also on later occasions when Moscow again raised the matter. But then, on the other hand, she did participate in the aforementioned parasynagogue, when it elected Pimen, and the Serbian hierarchs did not protest against this absolutely anti-canonical election, when he who had already been chosen and appointed by the God-hating regime was elected. Our Council of 1971 did not, and could not, recognize Pimen, whereas the Serbian Patriarchate recognized and does recognize him, addressing him as Patriarch, and is in full communion with him. And thus she opposes us directly, for we attempt at all times to explain to the “Free World” that the Soviet Patriarchate is not the genuine representative and head of the much-suffering Russian Church. But the Serbian Church recognizes her as such, and by so doing commits a grave sin against the Russian Church and the Russian Orthodox people. “How can there be any talk here of a special gratitude to her? Oh, if the Serbian Church would, while recognizing our righteousness, likewise directly and openly, boldly recognize the unrighteousness of the Soviets! Well – then there would truly be something for us to thank her for! But now, as it is, while extending one hand to us, she extends her other hand to our opponents and the enemies of God and the Church. If it pleases you, having shut your eyes to this sad reality, to thank the Serbs for such ‘exploits’ of theirs, then that is your affair, but I am not a participant in this expression of gratitude. “How dangerous are compromises in matters of principle! They render people powerless in defence of the Truth. Why is it that the Serbian Patriarchate cannot resolve to sever communion with the Soviet hierarchy? Because she herself is travelling along the same dark and dangerous path of compromise with the God-hating communists. True, she has not progressed along that path to the extent that the Soviet hierarchy has, and she attempts to preach and defend the faith, but if the shades and nuances here are quite different, yet, in principle, the matter stands on one and the same level”. Metropolitan Philaret had to suffer many slanders and attacks, even physical ones. Once a certain archimandrite in his presence declared to the other hierarchs that it was necessary quickly to remove “such an unfitting Metropolitan”… Again, in 1977, to a layman who was protesting against the ecumenist activities of Archbishop Anthony of Geneva, he said that while he agreed with his protest, he could do nothing to help him because he had a gun at his head – and at this point he formed the fingers of his right hand in the form of a revolver and pointed it at his temple. In spite of the opposition of individual bishops and clergy, as well as the enemies from outside the Church, Metropolitan Philaret was loved by the broad masses of the church people. As during his life in Harbin, the holy hierarch refused nobody help on his becoming First-Hierarch. He took special care over the spiritual enlightenment of the young people, whom he very much loved and by whom he was always surrounded. “We see a similar ‘paradox’ in the moral, ethical and spiritual evaluation of a person;… righteous men see themselves as sinners, while sinners see themselves as righteous. “Those who were pleasing to God thought of themselves in a completely different way and saw themselves and their spiritual nature in a completely different light. One ascetic wept all the time; his disciple asked him: ‘Father, what are you weeping about?’ ‘About my sins, my son,’ he replied. ‘But what sins can you have? And why do you weep over them so much?’ ‘My son,’ replied the ascetic, ‘if I could see my sins as they should be seen, in all their ugliness, I would ask you to weep for my sins together with me.’ That is how these extraordinary people spoke about themselves. But we, being ordinary people, do not see our sinfulness and do not feel its weight. Hence it turns out as I have just said: a person comes to confession and does not know what to say. One woman arriving for confession just said: ‘Batyushka, I’ve forgotten everything.’ What do you think: if a man has a painful hand or leg or some inner organ, and goes to the doctor, will he forget that he has a pain? So is it with the soul: if it really burns with a feeling of repentance, it will not forget its sins. Of course, not one person can remember all his sins – all to the last one, without exception. But true repentance unfailing demands that a man should be conscious of his sinfulness and feel sincere compunction over it. During the period of service of Metropolitan Philaret as first-hierarch of the Russian Church Abroad many new saints of God were glorified by the Church Abroad: Righteous John of Kronstadt (in 1964), St. Herman of Alaska (in 1971), Blessed Xenia of St. Petersburg (in 1978), the Synaxis of the New Martyrs and Confessors of Russia (1981) and St. Paisius Velichkovsky (1982). Of these canonizations the most significant was that of the Holy New Martyrs and Confessors of Russia. Unlike the seemingly similar act of the MP in 2000, this act did not confuse true martyrs with false, true servants of Christ with sergianists and traitors. Its influence within Russia was great. Time passed, and it became clearer and clearer that it was impossible for the Orthodox to have any kind of communion with the “churches” of World Orthodoxy, let alone be in them. In 1980 the ecumenical press-service (ENI) declared that the WCC was working out a plan for the union of the all Christian denominations into one new religion. In 1981 in Lima (Peru) an inter-confessional eucharistic service was devised at a conference during which Protestant and Orthodox representatives in the WCC agreed that the baptism, eucharist and ordination of all the denominations was valid and acceptable. But the greatest scandal was elicited by the Vancouver General Assembly of the WCC in 1983. Present at it were representatives of all existing religions, and it began with a pagan rite performed by the local Indians. Orthodox hierarchs took part in the religious ceremonies together with representatives of all the world’s religions. The Anathema against Ecumenism was seized upon with delight by the True Orthodox not only in ROCOR, but also in Greece and on Mount Athos, and may be considered the single most important ecclesiastical act of the True Orthodox Church in the second half of the twentieth century. For many who had been worried that ROCOR was not being firm and clear enough in her dealings with the ecumenists, it put an end to their doubts and reaffirmed their faith in her. The import of the anathema was clear: all Orthodox Churches that were fully participating members of the WCC fell under it and so were deprived of the grace of sacraments. Moreover, those in communion with the ecumenist heretics became participants in the same heresy. De facto, the ecumenists had already fallen away from the Church, and the anathema only witnessed to the faithful at large that they were outside the Church. Thus the work of Metropolitan Philaret’s whole life found its highest expression in a historical act having universal significance for the whole fullness of Orthodoxy – in the official anathematisation of “the heresy of heresies” and the apostates of our age. It is evident that no exhortation directed at the “Orthodox” ecumenists could have any effect, and a very powerful cauterisation was necessary in order to halt the general infection. “Brethren, we must fear this indifference to the truth. Our Lord Jesus Christ in the Apocalypse clearly indicates to us how terrible indifference to the truth is. There he turns to the Angel standing at the head of the Laodicean Church and says: ‘I know thy works. Thou art neither cold nor hot. Oh if only thou wast hot or cold! But since thou art neither cold nor hot (but lukewarm – neither the one nor the other, the truth is not dear to thee), I will spew thee from My mouth!’ As an organism cast out of itself something which is absolutely repulsive and harmful to it. “Let us remember that this indifference to the truth is one of the main woes of our age of apostasies. Value the truth, O man! Be a fighter for the truth… Place the truth higher than all else in life, O man, and never allow yourself to decline in any way from the true path. “… There are now many attacks on the Church Abroad. Not one Church is reviled as much today. And the servers of other Churches are not reviled as much as the servants of the Church Abroad. What does this mean? This is the most reliable sign that our Church stands in the truth, and therefore every lie, every unrighteousness has taken up arms against her in war… She stands in the truth and preaches this truth, announces it and defends it – hence all these attacks on her. Nearly thirteen years passed, and it was arranged that the remains of Metropolitan Philaret should be transferred from the burial-vault under the altar of the cemetery Dormition church of the Holy Trinity monastery in Jordanville into a new burial-vault behind the monastery’s main church. In connection with this, it was decided, in preparation for the transfer, to carry out an opening of the tomb. On November 10, 1998 Archbishop Laurus of Syracuse and Holy Trinity, together with the clergy of the community, served a pannikhida in the burial vault; the coffin of Metropolitan Philaret was placed in the middle of the room and opened. The relics of the metropolitan were found to be completely incorrupt, they were of a light colour; the skin, beard and hair were completely preserved. His vestments, Gospel, and the paper with the prayer of absolution were in a state of complete preservation. Even the white cloth that covered his body from above had preserved its blinding whiteness, which greatly amazed the undertaker who was present at the opening of the coffin – he said that this cloth should have become completely black after three years in the coffin… It is noteworthy that the metal buckles of the Gospel in the coffin fell into dust on being touched – they had rusted completely; this witnessed to the fact that it was very damp in the tomb; and in such dampness nothing except these buckles suffered any damage! In truth this was a manifest miracle of God. On the eve of the reburial of the relics, November 20, at the beginning of the fourth hour of the day, the coffin of the holy hierarch was taken from the Dormition church to the monastery church of the Holy Trinity in a car. The pannikhida was served by Archbishop Laurus and 20 clergy. None of the other hierarchs of ROCOR came to the translation of the relics of the holy hierarch Philaret (only Bishop Gabriel of Manhattan wanted to come, but he was hindered by a sudden illness). After the pannikhida the coffin with the body of the holy hierarch was placed in the side wall of the church, and at 19.00 the All-Night Vigil began. The next day, November 21, Archbishop Laurus headed the celebration of the Divine Liturgy in the church. With him concelebrated 18 priests and 11 deacons, several more clergy who had arrived prayed with the laypeople in the church itself. About 400 people gathered in the over-crowded church. All those present were greatly upset and grieved by the fact that during the pannikhida, as during the All-Night Vigil and the Liturgy, the coffin with the relics of Metropolian Philaret remained sealed. In spite of the numerous requests of clergy and laity, who had specially come to Jordanville so as to kiss the relics of the holy hierarch, Archbishop Laurus refused to open the coffin. He also very strictly forbade making photocopies from the shots that had already been taken of the incorrupt relics of the saint or even to show them to anyone. Archbishop Laurus called on those assembled to pray for the peace of the soul of the reposed First Hierarch until the will of God should be revealed concerning his veneration among the ranks of the saints… After the Liturgy a pannikhida was served, and then the coffin with the relics of the holy hierarch Philaret were taken in a cross procession around the Holy Trinity cathedral and then to the prepared place in the burial vault, where Archbishop Laurus consigned the honourable relics of the holy hierarch to the earth. Several miracles have been recorded since the repose of Metropolitan Philaret. Matushka Tatiana Fyodorov, the wife of Protopriest Constantine Fyodorov, writes: “During the time of the church troubles shortly after Metropolitan Philaret reposed, my husband was suffering very much over it. Hearing both sides of these sad situations finally ‘got to him’. He prayed to Metropolitan Philaret about it. He was very tired and fell asleep. He had a dream that he was in church, fully vested for the Divine Liturgy, and was told that Metropolitan Philaret was coming unexpectedly. He prepared to meet the Bishop with the Holy Cross on the plate. The altar boy gave Metropolitan Philaret the staff and Metropolitan gave the altar boy his staff. Metropolitan was looking very radiant and young. Then Fr. Constantine put the plate with the Holy Cross on the analoy, which is not customarily done, made a full prostration before the metropolitan and said: ‘Vladyka, it is so difficult for me.’ The metropolitan answered: ‘Yes, I know. But you, Fr. Constantine, should think less and pray more.’ Father tried to get up from the prostration but the metropolitan pinned his head down with the staff. At that moment, Father woke up full of joy and peace, but with a headache where the staff had been placed on his head. Since than, he feels Metropolitan is looking after him, and is always there to help. 1. The account of Protodeacon Christopher Birchall (Canada). I was told this story by Lydia Mikhailovna Klar, the wife of Evgenia Iosiphovich Klar, the dean of the Jordanville seminary. In 1994 it was discovered that their daughter-in-law, Irina Klar, was ill with cancer. Her husband, Michael, a doctor by profession, was in despair. He prayed ardently for her recovery, and at times it seemed that the illness was in recession. Recently, however, in 1997, there was a sharp deterioration. Lydia Mikhailovna gave the pious spouses a shirt that had belonged to Metropolitan Philaret, which she in her time had received from the cell-attendant of the hierarch, Protodeacon Nikita Chakirov. Irina put it on and immediately sensed a powerful fragrance; she thought that someone in the room had poured out some perfume. Irina and Michael prayed fervently for the whole evening, and then Irina fell asleep in this shirt. The next morning she felt significantly better and went to the hospital for an examination. As a result of the investigation it became clear that the cancerous tumour had become 70 times smaller! There was no rational explanation for this, and the hospital personnel were amazed. At the end of 1998 Irina’s tumour again began to grow. After the remains of Metropolitan Philaret had been uncovered and found to be incorrupt, Archimandrite Luke from Jordanville became to gather information on miracles. Irina decided that she had to tell him about her healing, and felt that she had not been right when she had been silent about it earlier. After she told Fr. Luke what had happened, she again felt better. Since then (a year has passed) she has been in good health. The cancerous tumour had not completely disappeared, but it has become so much smaller that Irina can carry on a normal life and dedicate herself to the upbringing of her children. 2. The account of Priest Stephen Allen (USA). 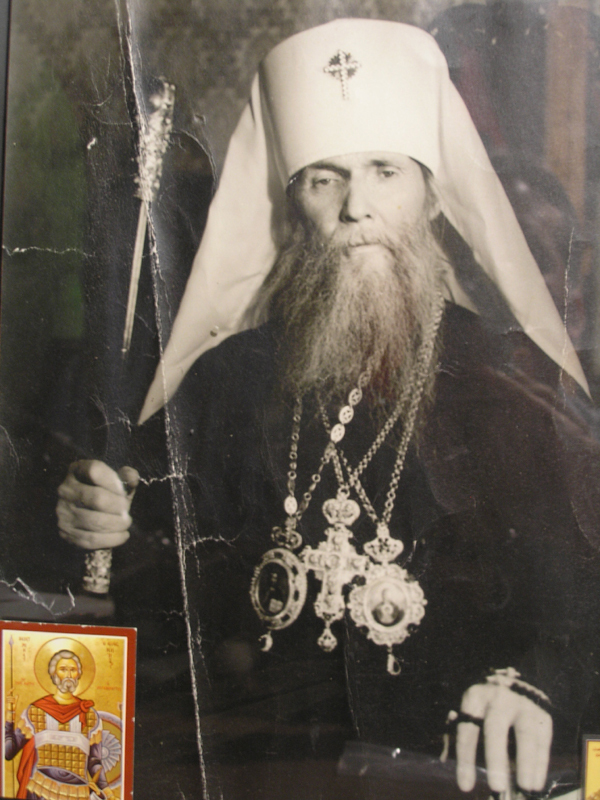 Above my desk a photograph of Metropolitan Philaret has been hanging for a long time. I attached no particular significance to it. But suddenly I had the thought that I should light a lampada in front of it and pray to Vladyka. Several days later I was informed that his incorrupt relics had been uncovered in Jordanville. And now I always pray to the holy hierarch Philaret. 3. The account of Protopriest Constantine Fyodorov (France). Just before going to Jordanville, on the occasion of the uncovering of the relics of Metropolitan Philaret, Matushka and I made a big trip around France. After two hours (it was necessary to travel seven hour in all), the car stalled. It seemed as if the petrol had run out. No matter how much I pumped the pedal, nothing helped. There was nothing around us, and my matushka panicked. I said: ‘There’s no need to worry so much – I’m wearing the epitrachelion of Metropolitan Philaret, and the main thing is that I have the Life-giving Cross. You’d better get down to praying.’ A couple of seconds passed, and suddenly she said from the heart: ‘Vladyko Metropolitan, help. It’s your child sitting here. Not for my sake, I’m unworthy, but for his sake, help us. Arrange it so that we can go further.’ I turned the key, and the machine started as if nothing had happened. That was a great joy for my matushka. 4. The account of Elena Kudryavtseva (Moscow). Some time ago, the symptoms of an allergy appeared in our little son. It got worse and worse from day to day. The doctors could give no coherent explanation of the rash, which spread all over his body, and in places was turning into a hard crust. Medicines provided only insignificant relief. Moreover, it was not without harm for the child to take the tablets so often. We didn’t know how to be or what to do. An acquaintance of ours, a pious and sincere person, who venerated Vladyka Philaret (Voznesensky), told a story about a seriously ill person who was taken to hospital. The doctors had already lost hope of curing him. The sick person took a photograph of the hierarch and with faith placed it on the painful place. Soon he improved, an operation was not required, and he was healed from his serious illness. Remembering this story, we took a photograph of the hierarch Philaret (Voznesensky) which had been taken not long before his death by Protopriest Constantine Fyodorov, and put it under the bed of the child. The next day the crusts on the legs of the child had begun to peel off, the rash became less, and after a time the symptoms of the allergy disappeared completely. 5. The account of Nun Cassia (Senina) (St. Petersburg). When in 1999 I was writing an article about the hierarch Philaret, ‘The Angel of the Philadelphian Church’, I was thinking: it’s interesting: am I right in all that I am writing, that is, am I right in feeling that the general direction of the life and actions of are genuinely True Orthodox and a reversal of the whole course of ROCOR in the direction of akriveia towards the apostates from the faith? (The question, as it turned out later, was not an idle one, insofar as, after the issue with the article came out, a ROCOR ‘patriot’, thinking that her hierarchs could not err in any way, in a private conversation accused me of re-interpreting the actions and words of the hierarch Philaret in the direction that I desired, when in actual fact, supposedly, he had never thought of breaking completely with the ecumenists, and that the present hierarchs of ROCOR were not departing from his course, but on the contrary were developing it.) The hierarch Philaret himself assured me of the correctness of my view by working a miracle. At that time I had already for several months been suffering from a strong pain in my side. At first, when it was only a little painful, I paid no attention to it, thinking that it would go away of itself. Two months passed, but the pains increased. I really do not like going to doctors, but I had to. As often happens, they did not give any coherent explanation. I was prescribed some medicines, but they didn’t help. In the end I decided to go to a private doctor, and the day before I suddenly remembered: tomorrow was the commemoration of the holy righteous Philaret the Merciful (December 1/14) – that is, the namesday of the hierarch Philaret! I rejoiced and thought: well, the hierarch will heal me. Moreover, it did not occur to me that he would miraculously heal me himself, I simply thought that he would help me find a good doctor who would finally begin to treat me properly. In the evening I prayed to St. Philaret the Merciful and the hierarch Philaret, and the next day it turned out that I could not go to the doctor, and I had to return home with nothing. I was going back somewhat discouraged, thinking: well, it was probably the will of God… But on the way back home the pain in my side stopped. At first, for some reason I paid not attention to this, since I had felt some relief on previous occasions. But time past, and the pain did not return. I understood that the hierarch Philaret had healed me. The illness did not completely disappear from that day: although the sharp pains had gone, I still felt a little pain at times. The pain stopped completely some time later, in the year 2000, after I had received communion on the day of the commemoration of the hierarch, October 28 / November 10. 6. The account of Irina Smirnova (Konigsberg). I am a journalist. I obtained work in the editorial office of a newspaper, but it was very difficult for me working there: I began to get an allergy from the ordinary dust, since I cannot be in an unventilated place, whereas my neighbour in the office, on the contrary did not like draughts and was always closing not only the hinged pane, but even the door into the office. I was suffocating, I was dying, I ran to inject myself, without pills I couldn’t enter the office. An acquaintance of mine advised me to pray for help to the hierarch Philaret. I began to pray to him, and soon the editor gave me a separate office, and I simply, so to speak, ‘rose from the dead’…. The following miracle was accomplished through the prayers of Metropolitan Philaret took place on the feast of St. Stephen, January 9, 2006. It took place in the True Orthodox women's monastery of New Stenik, which has just been built in a very remote part of Serbia in spite of threats to destroy it coming from the false patriarchate of Serbia. The nuns were expelled from Old Stenik a few years ago because of their opposition to the heresy of ecumenism, and are under the omophorion of a hierarch of the “Florinite” branch of the True Orthodox Church of Greece. Nun Ipomoni (which means “patience” in Greek) suffers from very severe asthma attacks. On this day, she had the most severe attack yet and suffocated. For 20 minutes she did not breathe and her body was without any sign of life. Now it should be noted that a few days before this, the 10 nuns in this monastery led by Schema-Abbess Euphrosyne had earnestly prayed to the Lord to give them the fear of God. During the 20 minutes that she was clinically dead Nun Ipomoni met several demons in a dark tunnel; they got hold of her and were trying to drag her to hell. It was a most terrifying experience. After 20 minutes, Matushka Euphrosyne anointed her dead body with oil from the lampada in front of the icon of Metropolian Philaret of New York. At the moment when the oil touched her head, which felt like an electric shock, she revived and began to move. For some afterwards, she was still very weak and wept all the time. But the next day Fr. Akakie arrived at the monastery, served the liturgy for three days in a row, communed her and gave her the sacrament of Holy Unction. Now she has fully recovered. She feels well, walks and even prepares food. This whole incident has had a very beneficial effect on all of the nuns. Their prayer to receive the fear of God was answered. And they ardently thank God and his great hierarch, Metropolian Philaret of New York. March 22 / April 4, 2006. Birthday of Metropolitan Philaret of New York.